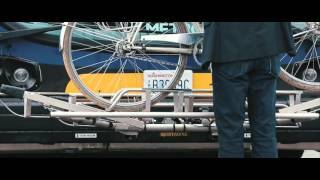 Designed to attach in two easy steps, the TSB provides all the security and features provided by Romeo Rim HELP® bumpers and Sportworks Bike-Racks-for-Buses™. This unique bracket designed for use with select Sportworks transit racks will save valuable labor hours, and allow convenient removal of the complete bike rack assembly for towing, storage and vehicle maintenance. STEP 1 - Insert Ten Second Bracket™ through slots and holes in Romeo RIM HELP® bumper. A collaborative design and engineering project between Sportworks and Romeo RIM has made the task of installing Bike-Racks-for-Buses™ quick and easy. 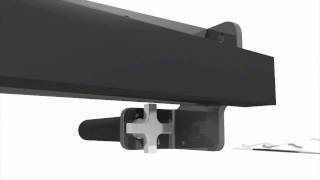 The OEM fabricated slots in the HELP® bumper module, and the high strength aluminum beam in the bumper, permit quick and easy installation with no tools required. Best of all, the original OEM bumper warranty is not affected. The TSB system uses a pre-loading concept that, with some assistance from gravity, securely engages the top slots of the bracket. This allows the unit to be vibration free and tight as a drum. Minimizing the movement of the bracket at the contact point ensures noiseless travel and also greatly reduces long-term wear and possible material fatigue. STEP 2 - Tighten the hand knob to secure the bolt into the threaded holes in the aluminum beam of the HELP® bumper. Minimizing the time and eliminating the tools needed to install the transit rack were our most important design objectives. We achieved this goal by developing mounting hardware that can be easily, quickly and firmly secured by hand. The knob is connected to a long bolt that fits through the mounting bracket and is threaded into the high strength aluminum beam of the HELP® bumper. A clevis pin engages through a hole in the hand knob to prevent it from loosening. The TSB system provides a convenient and practical solution for towing, bus garage parking density issues or seasonal use of Bike-Racks-for-Buses™. The greater Seattle area is home to the country’s largest and oldest vanpool programs. Sportworks proudly offers a vanpool program to all employees so they can enjoy a no cost, stress-free ride to work. Over 30% of Sportworks full-time employees utilize vanpools for their daily commute, helping reduce congestion and carbon emissions.